If Samuel Beckett were alive today and writing bleak plays about climate activism, the plot would probably sound very much like Monday's 19-mile trek from Richmond to Middlesex through hail, wind and rain. But the thing about people who sign up to walk 65 miles over five days in the name of forestalling global disaster is that normal things, such as weather, don't dissuade them. Next Steps: A Climate Solutions Walk, organized by 350 Vermont, encompassed a buffet of other issues, including, but not limited to, the patriarchy, white supremacy, colonialism and capitalism. On Monday, approximately 50 walkers interested in dismantling all of the above, plus me, set out around 9 a.m. from the Richmond Congregational Church. 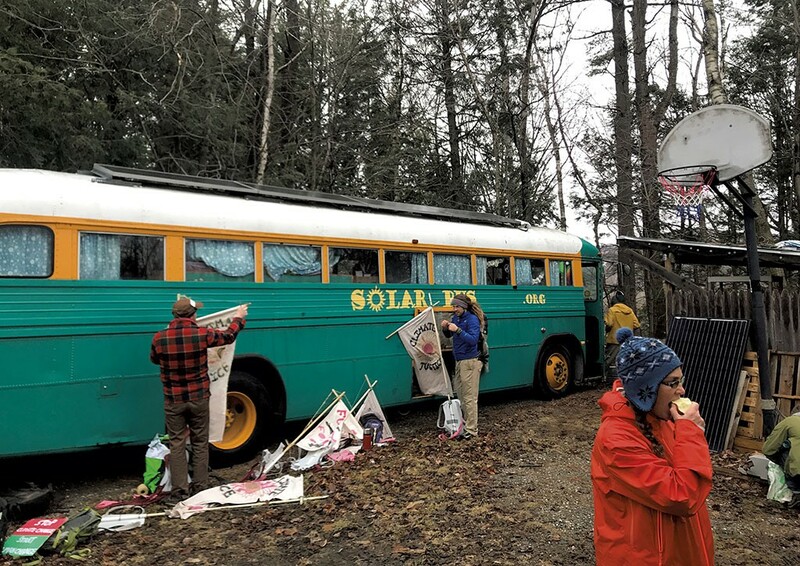 This was the fourth leg of a five-day walk that began in Middlebury last Friday and ended at the Statehouse on Tuesday. Several people volunteered to carry Climate Justice banners that hung from insanely tall rods attached to harnesses meant to be worn like backpacks. These apparatuses effectively turned the bearers into human Sunfish in the 20 mph wind gusts, though happily, no one blew away. A camper van carrying a composting toilet followed the procession. After five miles, somewhere between Richmond and Bolton, we took a break at the home of Gary Beckwith. We stood in his garage and ate organic lentil turmeric chips and dried snap peas and other assorted plant-based snacks. We ogled his Solar Bus, which is fueled not by solar power, as the name would suggest, but by purified used cooking oil from restaurants. Beckwith informed me that the bus gets eight to 10 miles per gallon on the stuff. Back on the road, the wind picked up again, except this time it pelted us with hail. 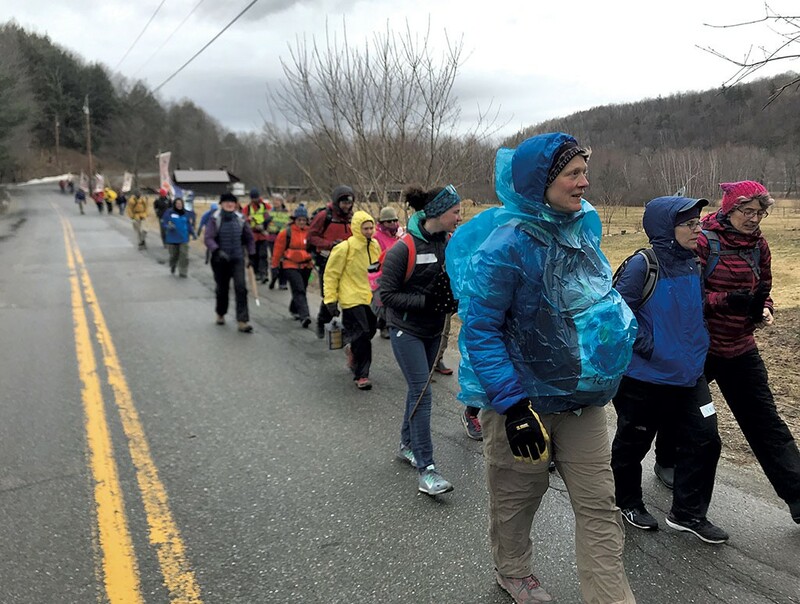 Whenever I looked up and saw the dark green jacket of Byron Stookey, an 85-year-old man from Brattleboro who had signed up to do the whole damn walk, I got a deep adrenaline rush, like I could have challenged that hail to an arm-wrestling match and won. I usually found myself walking alongside someone interesting — one of the founders of Front Porch Forum, an itinerant Quaker minister, a non-itinerant Episcopal minister, a saxophonist in a klezmer band, a bassist-turned-Brussels sprouts farmer. I explained my flotsam theory to Zac Rudge, development and communications manager for 350 Vermont. In his cheerful Aussie lilt, he told me that the United States used to sell its recycling to China, because most of our recycled goods are too schmutz-encrusted to be immediately converted into something useful and therefore require cheap labor to sort and clean. But in January 2018, the country decided it didn't want our discards anymore. Since then, one study predicted that by 2030, an estimated 111 million metric tons of plastic waste worldwide would be displaced because of the moratorium. Basically, all our well-intentioned recycling has created an enormous pile that no one wants to deal with, and the only solution is to find another place for said pile until it gets so big that we can't move it anymore, at which point we will be swallowed by the pile. Marcy Kass, a member of the march Action Council, feels overwhelmed by the crisis facing our planet — the pile, everything. "I don't know how anybody thinks about anything else, honestly," she said. "Sometimes, I get so upset about it that I can't even stand to be in my own body." Meanwhile, we trudged along Route 2 through Waterbury as rush hour traffic whizzed past. People honked at us from their SUVs and yelled out the window, "Thank you for all that you're doing!" One guy actually pulled over, got out of his car and shook all of our hands. I almost blurted out to him that I'd had nonlocal deli ham on my bagel sandwich that morning. The thing about walking 19 miles is that once you manage to get that far, you realize that the human body is capable of doing all kinds of things that modern life doesn't typically encourage. Walking 19 miles to the office would be very inefficient, but the whole idea of efficiency is predicated on the need to be productive and contribute to society and do other things that our late capitalist milieu demands. This train of thought was mercifully interrupted by Sam Bliss, a doctoral student at the University of Vermont who's studying — what else? — nonmonetary food-sharing systems. "If I weren't on this walk, I'd just be sitting at my desk, responding to email," he said. We talked about how responding to email has become the new metric of Getting Stuff Done. Were we being more productive out here, walking in the freezing drizzle? We arrived at our destination for the evening, a three-bedroom ranch house in Middlesex — slash, as of that very day, a defunct cricket farm. The company, Flourish, ceased operations on April 8 due to a lack of consumer demand and the prohibitive cost of scaling up to meet industrial cricket powder needs. This felt unbelievably depressing to me. For dinner, there was vegan stew, salad, bread, cheese and pickled green beans. We ate with compostable forks, which were very nifty except for the fact that the prongs weren't quite sharp enough to spear the cherry tomatoes in the salad, which lent the whole eating enterprise a Whac-a-Mole-esque sense of futility. But perhaps I'm making too much of a blunt fork. Maybe it's just a question of acclimation to new utensils. I tracked down octogenarian Stookey and asked him what he thought of the situation. "I'm panicked," he said. "I want my grandchildren to have a world, and at this rate, they won't, because the so-called grown-ups have failed them." He looked around the room at the sea of exhausted bodies, sprawled on every available square inch of wood floor. "These," he said, "are the real adults." The original print version of this article was headlined "The Trudge Report: Seven Days Joins a Walk to Save the Planet"